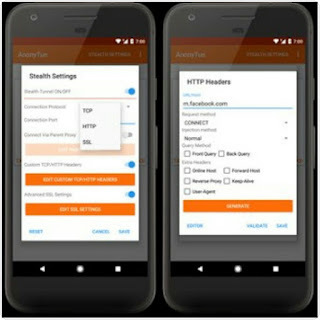 Do you know AnonyTun VPN is a Virtual Tunneling Network app that helps in bypassing firewalls and geo-restrictions. The app provides a secure connection that helps in protecting its users privacy. The app has different features to help those who would want to access the internet for free on their ISP network. AnonyTun VPN comes with a clean and neat design for ease of use. The app is equipped with different protocols which gives the user several options on how to connect. User can modify the custom TCP/HTTP Header and SSl settings for a strong injection. 1. No Bandwidth limitation (Unlimited Bandwidth). 2. No root needed for it to work. 3. Availability of SSL, HTTP and TCP Tunnel. 6. Bypass any type of restriction. 1. Its free and doesn't require any payment. 2. Its servers are unlimited. 3. No data cap on its bandwidth usage. 4. It doesn't require root. 5. Availability of several options to bypass ISP firewall an Geo-restrictions. Next, you have to Download AnonyTun on Playstore from here. Or from another source by clicking here.